Last week I was thrilled to find that a Comic-O-Matic user actually sent me $5 through the PayPal donation link at the bottom of the page. I can’t express how amazing that feels: that someone out there likes this web-thingy I made and shared enough to voluntarily send me some real money in appreciation! Wow! I want folks to know that even though Comic-O-Matic is still under development, I plan to keep Comic-O-Matic FREE – even when I get to the point of adding a feature to let users set up accounts to save their strips – and I NEVER want advertisements cluttering the site. If you like what you see, please consider scrolling to the bottom of the Comic-O-Matic page and sending a little something to Nina and/or me in appreciation of her artwork and/or my programming. Thank you for just using Comic-O-Matic! I selected the panel background colors for Comic-O-Matic from the colors used by Nina in her Mimi & Eunice strips. Originally, I grabbed just 10, but today I have expanded the number of colors available to 25. By having more colors in the palette, the chances of having two panels the same color is reduced. 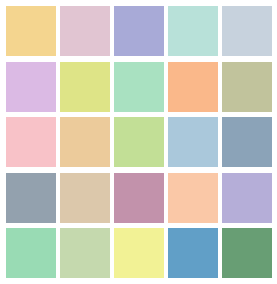 I will eventually set up a color-picker, to give users creative control over the colors of their panels, but for now, they are still just randomly selected per panel from this set. I am also thinking ahead to the possibility that other artists might create sets of their own artwork to work with Comic-O-Matic, as “skins”, so that users could select from a number of artists for their strips. Each of these skins would include its own color palette as well as artwork and a font. (And maybe other things – I don’t know yet!) I’m not ready to do this now, but you never know what each new day may bring! Ultimately, I do want to get the scripts to a point where I’m not tweaking them daily, and then I’ll release a stable version on GitHub for anyone to copy and do whatever they want to with. I plan to have the release include templates for the pieces of artwork that Comic-O-Matic requires. If you are an artist who is interested in this prospect and willing to release your art as freely for copying and reuse as Nina does, let’s talk!